The Danville Public Library was originally the Sutherlin House, which was built for Major William T. Sutherlin in 1857-58 on a four-acre plot on Danville's Main Street. Major Sutherlin was a member of the historic Virginia Convention of 1861, and at the outbreak of the Civil War he became Chief Quartermaster for Danville with the rank of major. On April 2, 1865, when it became obvious that the Confederate forces could no longer defend Richmond, the Confederate government decided to leave the city for the temporary capital at Danville. President Jefferson Davis and his cabinet arrived in Danville on April 3, 1865, and it was decided that the Confederate president would be the guest of Major Sutherlin. While at this house, on April 4, 1865, President Davis signed his last official proclamation as President of the Confederate States of America. 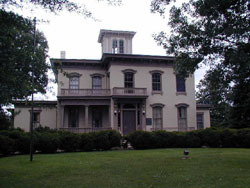 It is believed that President Davis received the news of General Lee's surrender at Appomattox Court House while having dinner at the Sutherlin House on April 10, 1865. That evening he and his fugitive government left Danville for Greensboro, North Carolina, on their "flight into oblivion." The exhausted Confederacy surrendered, piece by piece, soon after. The Danville Public Library, a two-story stuccoed house, is an outstanding example of the Italian villa style. Today the Danville Public Library is the Danville Museum of Fine Arts & History. The Danville Public Library, now the Danville Museum of Fine Arts & History, is located at 975 Main St. It is open Tuesday-Friday 10:00am to 5:00pm, and Saturday-Sunday 2:00pm to 5:00pm. There is no admission fee, but contributions are welcome to support the cultural and educational mission of the museum. Please call 434-793-5644 for additional information or visit the museum's website.